Here in North America, Wednesday morning, January 31, you have your chance to photograph the first supermoon total lunar eclipse since September 2015. This article will show you how. The common current definition of a blue moon is when there are two full moons in one calendar month. Blue moons are not blue in color unless there is ash in the atmosphere from volcanic activity. The older and technically correct definition of a blue moon is the third of four full moons in the same season. Blue moons are not rare. Supermoon is a new, non scientific term to refer to a full moon when the moon is closest to the earth (perigee) and is somewhat large in size and somewhat brighter. To the naked eye (for most untrained observers) a supermoon doesn’t look any different than any other kind of full moon. Supermoons are not rare. Blue moons and supermoons are only occasionally associated with an eclipse. So we are getting a trilogy on Wednesday: a blue moon, a supermoon, and an eclipse. Technically speaking, perigeee is at 4:54 am EST on January 30, but the popular media is mostly ignoring that fact so we can have fun with this trifecta of lunar events. 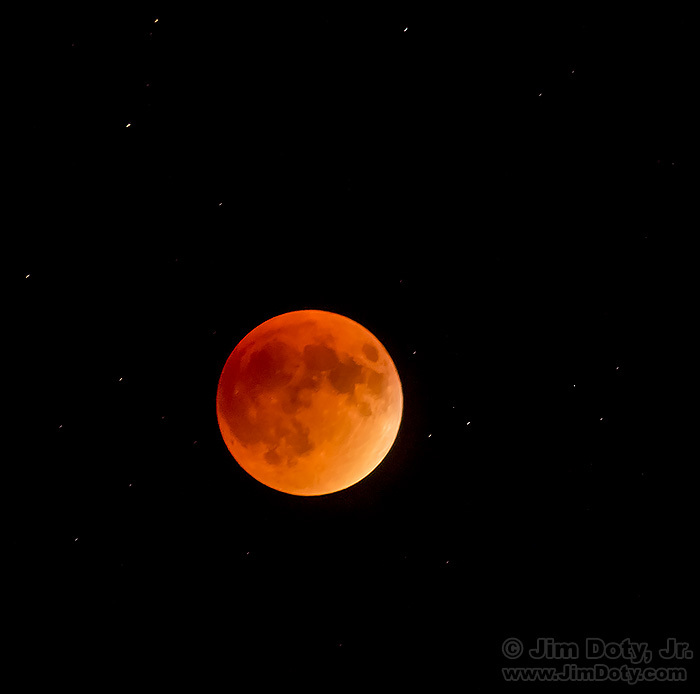 Blood moon refers to the yellow-orange color of the moon during eclipse totality. This happens with almost all lunar eclipses unless there are unusual atmospheric circumstances. The intensity of the color varies with each eclipse, due to the amount of moisture and dust particles in the air. The terms supermoon and blood moon are mostly used as a modern form of hype to promote eclipse watching. Some people flood the internet with weird supermoon, blood moon, and blue moon memes with no basis in scientific fact (“once in a lifetime”, “first time in 300 years”). And finally, supermoon and blood moon are used by some people to promote religious prophecies, usually of impending doom. Where Can You See the Eclipse? Greatest eclipse happens at the same instant worldwide, but our clocks say different times. Chart by Fred Espenak at Earth and Sky. The farther west you live the more of the eclipse you will see. If you live in the eastern United States the moon will set before totality happens. If you live in the east and you can travel on Tuesday, head west, the farther the better. The moon will be in the western sky so you want a clear, unobstructed view of the western horizon. If you have mountains just to the west of you, head east about 50 to 75 miles so the mountains won’t block your view. 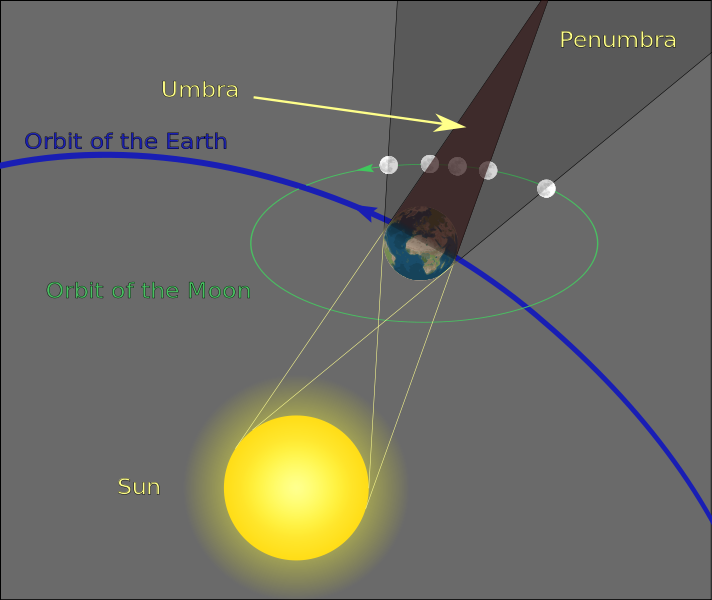 In any umbral lunar eclipse, the moon always passes through Earth’s very light penumbral shadow before and after its journey through the dark umbral shadow. From Earth and Sky. Unlike a solar eclipse where the moon’s shadow races across the continent and the eclipse happens at different times, the earth blocks sunlight on the moon’s surface at the same time everywhere. This happens gradually as the moon passes into the penumbra and then into the umbra and totality. Here are the eclipses time in UTC and in North American time zones as provided by Earth and Sky. You will need a camera with a long lens. The longer the focal length of your lens, the bigger the moon will be. If you have a lens that is 200-400mm in focal length or longer you will get a relatively nice sized moon. The effective 35mm focal length of the image above was 456mm (285mm focal length on a camera with a 1.6X field of view crop). Much shorter than 200mm and the moon will look disappointingly small compared to the nice eclipse photos you see online and in magazines. If you don’t have a long lens it isn’t too late to go to your favorite well stocked camera store and rent a lens. If you order a lens today from LensRentals.com and pay for overnight shipping, the lens will arrive tomorrow and you will be ready by Wednesday morning. A sturdy tripod and tripod head are essential. At totality you will need exposures time around 1 to 2 seconds so you can’t reliably hand hold your camera. If you don’t have a long lens, you can still take eclipse photos by making them more about the night or early morning sky that just happens to have a small, yellow-orange moon in the photo. Techniques for all lunar eclipses are pretty much the same, supermoon or not. If your camera isn’t already set up this way, set your camera to capture RAW plus JPEG files at the highest resolution, set the color space to Adobe RGB (1998), and set the white balance to daylight. All of this will give you better image quality when it comes time to do the post processing. Critical focus can be hard to achieve and you can’t put your ultimate trust in autofocus. The best way to focus is to use your camera’s “live view” mode. Before the eclipse starts, begin with your camera in normal viewing mode (through the viewfinder) and autofocus on the moon. Then turn autofocus off. Turn on live view mode, center the moon in the viewfinder, and magnify the image to 10x on the LCD and manually focus the lens. Take a test shot and magnify the image to make sure everything looks sharp. For more information, read How To Get Critical Focus in Live View Mode with a Magnified Image. 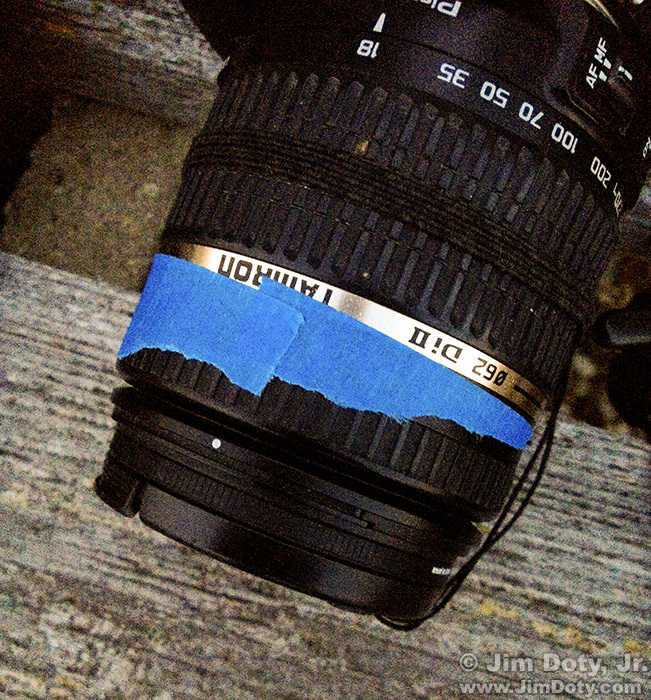 If everything looks sharp it is a good idea to tape the focusing ring in place so it doesn’t move. Don’t use duct tape! Gaffer’s tape is best and painter’s tape would be the second choice. In “live view” mode the mirror of a DSLR is is locked up. That is a good thing – you won’t get image degradation due to mirror slap. So it is best to leave the camera in live view mode. If your camera doesn’t have a reflex mirror you don’t need to worry about this. You don’t want to jiggle the camera by pushing the shutter button, so turn on the two second self timer so there is time for vibrations to die down after you push the shutter button. It would be even better to use an electronic cable release. Incidentally, live view mode will drain the battery faster than normal viewing mode, especially in cold weather, so make sure you charge your battery and backup battery the night before the eclipse. This article assumes you understand exposure basics and the interactions of aperture settings, shutter speeds and ISO settings. If not, read the exposure series which begins here. Don’t trust auto exposure. Set you camera to manual metering mode and use the following guidelines. Before the eclipse begins, set your aperture to f/8, your shutter to 1/100 second shutter, and the ISO to 100 and take a picture. Feel free to bracket by using shutter speeds of 1/200 and 1/50. As the eclipse progresses and the moon gets darker, you will need to gradually increase the ISO and the shutter speed. While your LCD images are not a totally accurate guide to exposure, keep an eye on the images to make sure your moon isn’t totally washed out or really, really dark. Bracket your exposures from a little too light to a little too dark. It is impossible to predict how dark each lunar eclipse will be at totality so I can’t tell you in advance what the exact correct exposure will be. Generally you will end up around 1 or 2 seconds with an ISO of 1600, but be flexible. For the 2015 eclipse above I ended up with 1 and 2 second shutter speeds at ISO 1600. If you live in the far West, follow this procedure in reverse as the moon gets lighter after totality against the still dark sky. If you are in the central and eastern U.S., be careful not to burn out the sky. At some point, especially in the East, you may lose the moon as it gets darker and the sky gets lighter, another reason to head west. During a two second exposure stars will trail a bit during the exposure, along with some potential blurring of the moon. You can minimize blurring of the moon with an astronomical clock drive set to the motion of the moon (not the motion of the stars). The good news is you can get a surprisingly good image of the moon in a 1 or 2 second exposure without a clock drive as long as you aren’t using a super long lens (500mm and up). The photo at the top was taken at 2 seconds without a clock drive. Do not use a shutter speed longer than 2 seconds with lenses as long as 300-400mm. Do not use a shutter speed longer than 1 second with lenses 500mm or longer. If the moon is too dark, go to a higher ISO. ISO 1600 means a fair amount of noise. Some judicious post processing with Adobe Camera Raw will help reduce the noise to have a sharp clean image. You may need to adjust the exposure, clarity, and vibrance sliders in the basic panel to get the optimum image. If you don’t get a chance to photograph this lunar eclipse, you can always use these techniques on the next one. Earth and Sky, Time and Date, and Space.com will let you know when the next lunar eclipse is going to occur. Photo Data: Canon 7D Mark II. Canon EF 70-300 f/45.-5.6 DO IS USM lens at 285mm. 2 sec, f/8, ISO 1600. If you want to know more about photographic exposure, making the most of your camera gear, night sky photography, landscapes photography, wildlife photography and a whole lot more, read Digital Photography Exposure for Dummies, one of the highest rated photography books at Amazon.com. Learn more about the book here and order it here. 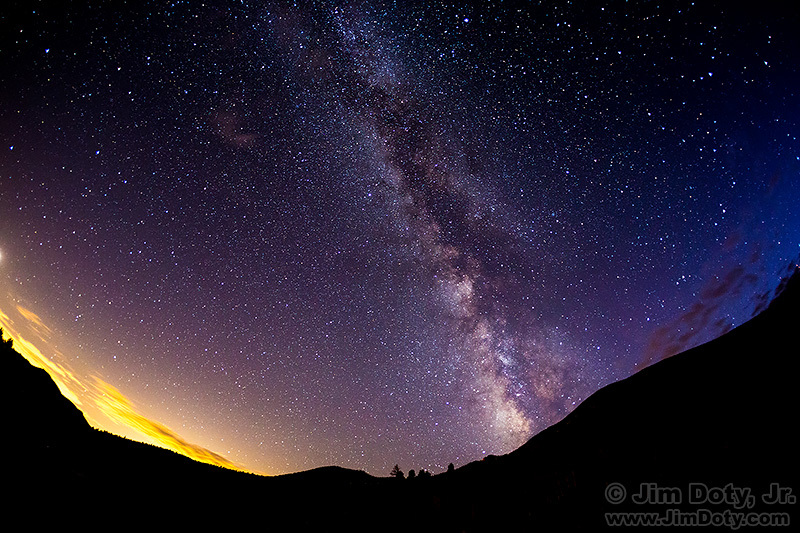 Milky Way from Horseshoe Park, Rocky Mountain National Park, Colorado. September 27, 2015. 8:06:12 PM MDT. Canon 5D Mark III. Canon EF 15mm f/2.8 lens. 30 sec, f/2.8, ISO 3200. This entry was posted in General, Metering, Photographs, Techniques, Using Equipment by Jim. Bookmark the permalink.